Halloween was super fun this year! It was the first year that the lion was really really excited about it. In fact, he woke up and asked to go trick or treating yesterday even before he had his jim jams off. This year I decided since Hubs was working and had to miss out on all the fun, the lion and I would do a joint costume. Now, now…we are not dressing up as marijuana cigarettes…I meant a costume that goes together…cool it people. This year I got him a really cute dragon costume so I decided to be the Paperbag Princess from the classic Robert Munsch book “The Paperbag Princess”. Funny enough, in the morning the lion called me the ‘paper towel princess’. I picked him up, gave him a tickle and said ‘yup, i’m the quicker picker upper’ and tickled him some more. 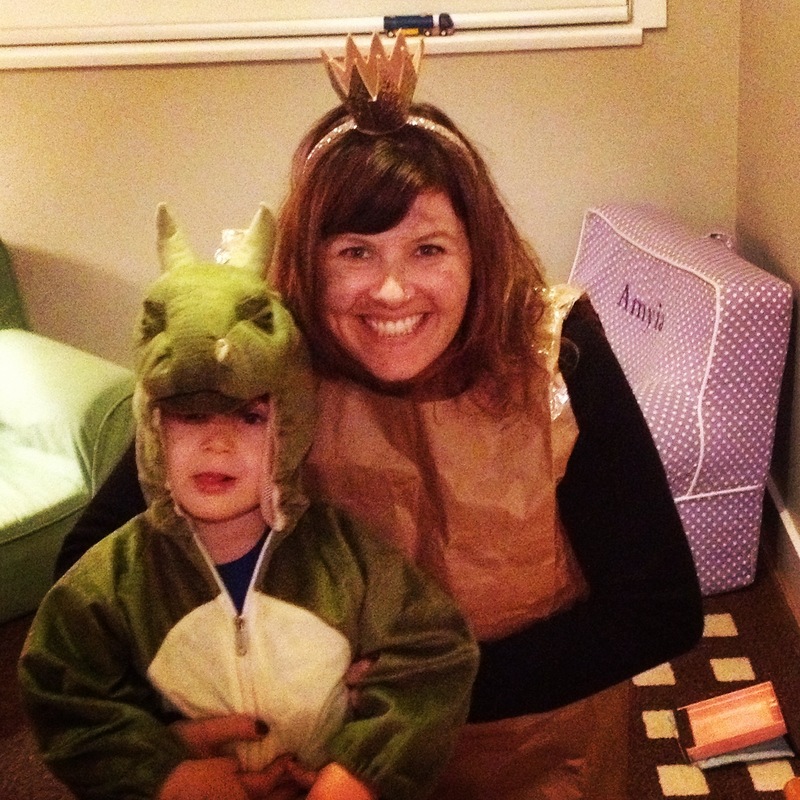 Paperbag Princess and the fire breathing Dragon. It was a blast and a half. Although, I did dress up for work and since it was raining most of the day…I had to take my paper bag dress off or it would have been ruined when I went out at lunch to grab a sandwich. As I approached the sandwich shop I realized…I don’t have a costume on…I just look dirty and homeless. Yikes. Oh well, the sandwich was worth it!! 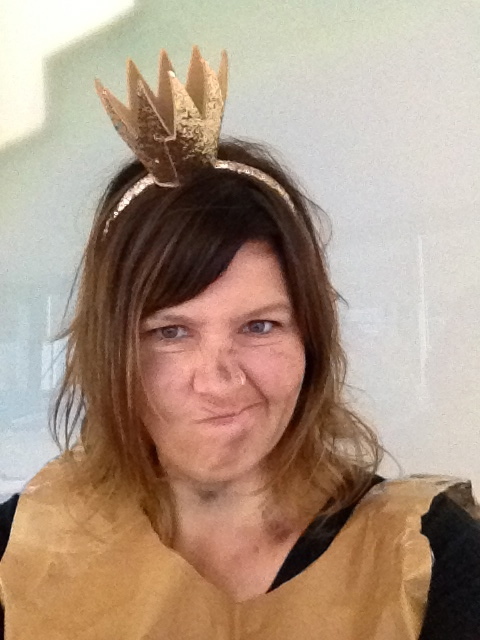 See…if you ran in to me at lunch without my crown or paper dress…you would probably just think I was dirty! 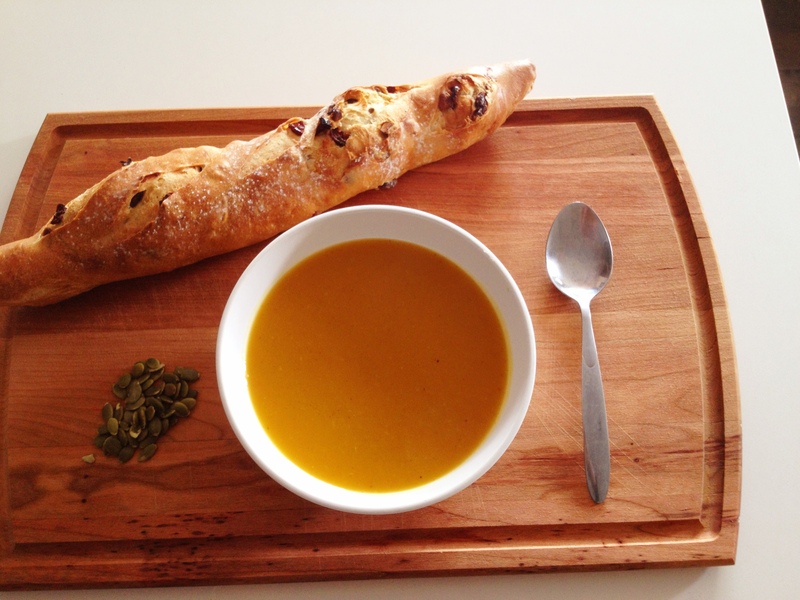 Now that Halloween is over and all the madness that is pumpkin is finally starting to go away, its time stop eating candy and make a delicious homemade soup!! (Yes, I am doing a happy dance in my mind where I am smashing bottles of pumpkin ale, blowing out pumpkin candles and throwing pumpkin donut holes in the garbage). 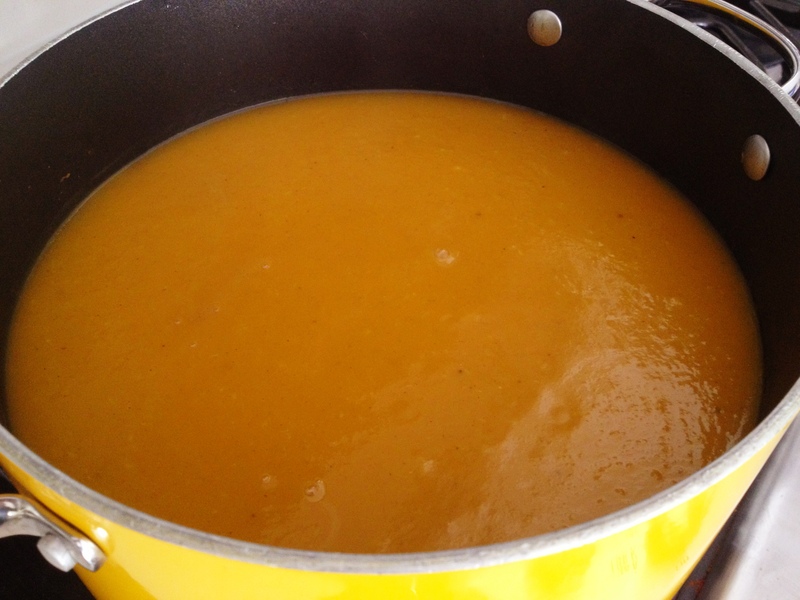 When it’s cold out, I tend to make a pot of soup every Sunday and start my annual instalment of Sunday Soups! 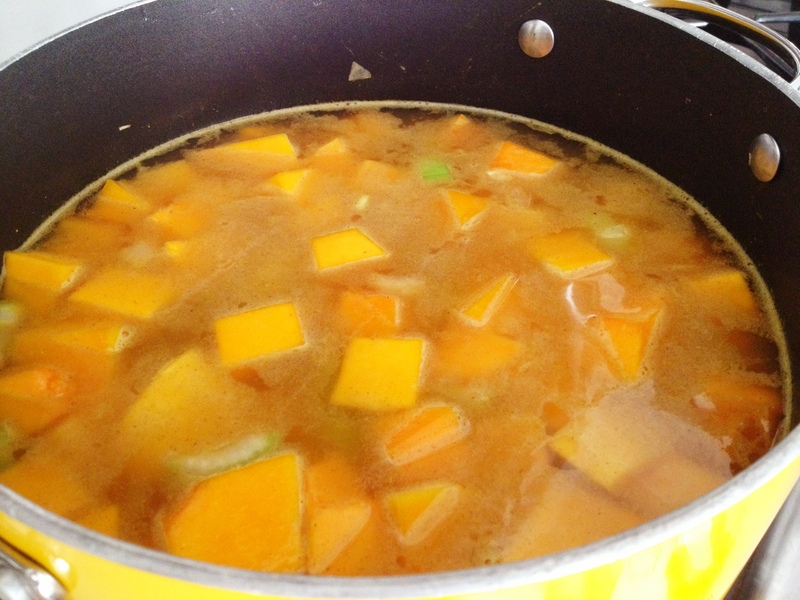 Well…today is Saturday and I’m just craving soup so I’m doing it!! Plus I got a gorgeous loaf of pistachio/cranberry bread which will be a fabulous dunking agent for my bowl. Yup…I’m gluten exclusive and love me some carbs. This soup is so flippin easy and packed with mega flavour you can pretty much guarantee the feeling of the comfiest hug on the planet. It’s a butternut squash soup with hints of maple and curry and it’s so silky and delicious you won’t be able to stop eating it!! I love a good soup that is minimal effort but tastes ultra luxe. Let’s do this!! Peel and chop your veggies (Butternut Squash, Carrot, Celery, Onion). 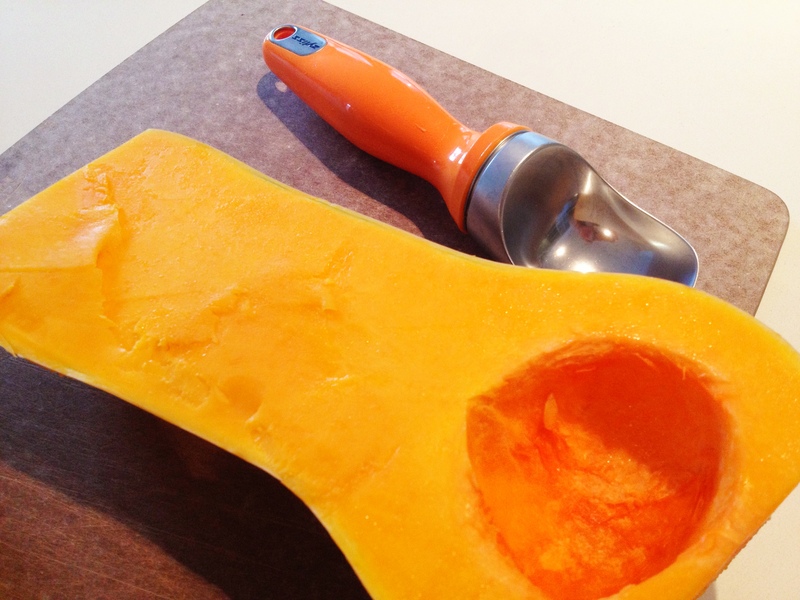 Some people use a spoon to get those seeds out of the butternut squash. I use my ice cream scooper…it makes life MEGA EASY!! Use your icecream scoop to scoop out those seeds and that flesh. It’s a snap!! 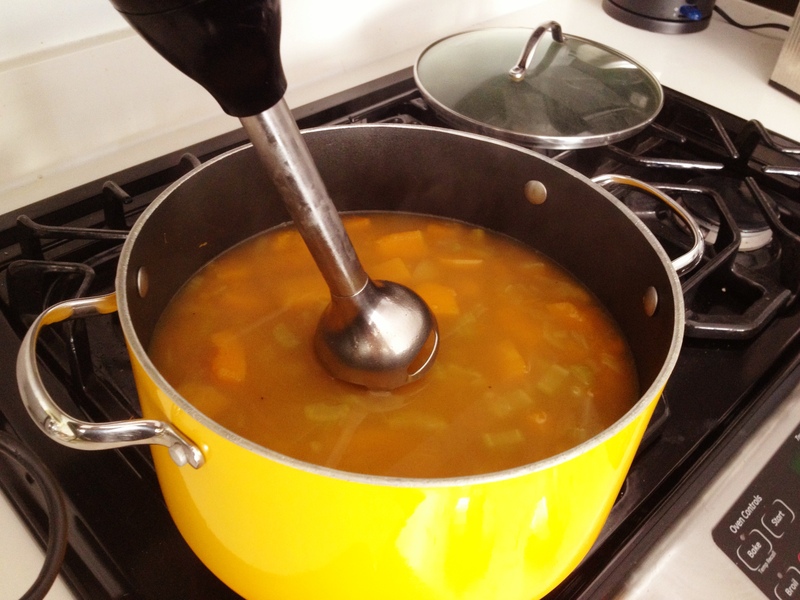 Now grab your favourite sauce pan…yes, mine is a yellow pot I bought on clearance at winners 10 years ago. It looked so lonely, wasn’t a part of a set and I just thought it was so nice and bright I had to bring it home and let it know it’s loved. Put a tiny bit of EVOO in the pot and heat to medium. 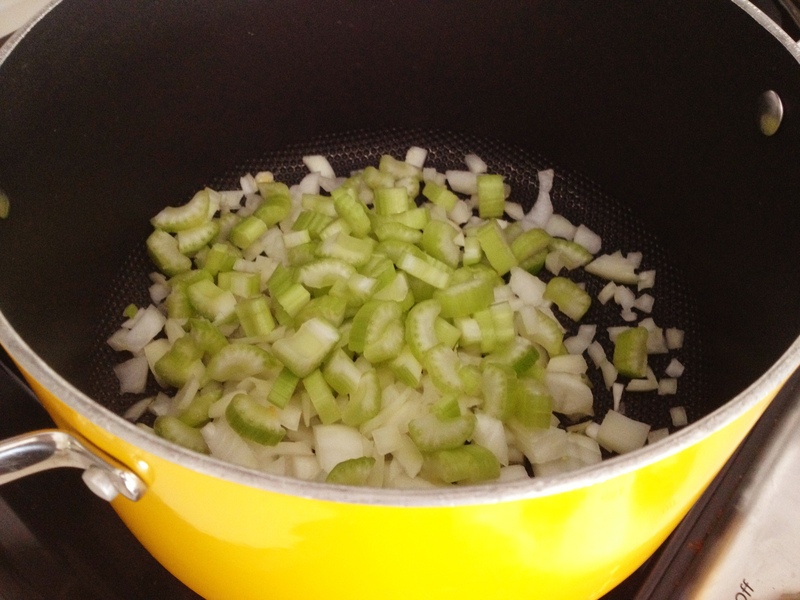 Add your onion and celery and let cook for 1-2 minutes or until the onions sweat. stir the onion and celery around until they start to sweat and the onions are translucent. Add everything else on the list to the pot and then add your water. Bring to a boil and then reduce heat to medium and let simmer for about 25 minutes or until the vegetables are soft and fully cooked. You may want to add some salt at this stage for some added flavour (squash tends to be a bit sweet so you want to balance it out). Remove from heat and then take an immersion blender and blend the mixture until smooth. You can also transfer the mixture to a regular blender as well. I just like the hand blender method because 1) I actually own one and this helps me justify having it and 2) it’s so easy, just put it directly in the pot and voila. *It’s also a whiz to clean up!! Wowsa, look at that silky goodness!! Place in to bowls and garnish with a drizzle of maple syrup and some pecans or pumpkin seeds. Serve with some delicious bread and you have another dinner winner! Place in bowls and top with a drizzle of maple syrup and sprinkle of pumpkin seeds and/or pecans. Serve with a nice crusty loaf. This recipe can also be adapted to cook in your crock pot. Place all of your ingredients in the slow cooker and place on low for 8 hours or high for 4-6 hours. Unplug and then puree in a blender and voila!! I hope you guys enjoy this tasty pot of goodness. Its a quick, delicious meal that is super good for you and really is uber easy to make. This is a great dish for meatless monday’s or the vegetarian (or vegan) in your life. Slurp away fine people. I totally endorse this! !